If you live in Los Angeles, you may want to take advantage of DineLA Restaurant Week. Some terrific restaurants are offering meals for $26, $34 or $44.00, that would usually cost much more. It's an opportunity to eat at some great spots, for less than regular prices. Click here for details. 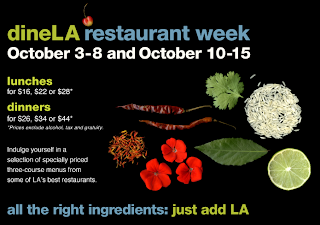 As part of LA Restaurant week, dine 3 times at participating restaurants and get an American Express $20.00 statement credit .